William Merritt Chase (1849–1916), Park in Brooklyn (Prospect Park) (c 1887), oil on panel, 41 x 61.3 cm, Parrish Art Museum, Southampton, NY. The Athenaeum. The nineteenth and early twentieth centuries were times of great change throughout Europe and America. Cities grew, became heavily industrialised, bred squalor among the poor, and offered grandeur to the rich. Landscape painting became increasingly popular, and with it depiction of the urban landscape. Manet and the French Impressionists documented the transformation of Paris, and those American painters who trained in France often painted its landmarks, and favourite views of the bridges over the River Seine, for example. This article, and its sequel, look at how a succession of major artists – Eakins, Chase, Henri, Cooper, and Bellows – painted the cities of the East Coast, between 1870 and 1914. Trained in Paris in the Salon tradition, Eakins painted and taught in the cities of Philadelphia, Washington, and New York. Thomas Eakins (1844–1916), The Champion Single Sculls (Max Schmitt in a Single Scull) (1871), oil on canvas, 81.9 × 117.5 cm, The Metropolitan Museum of Art, New York, NY. Wikimedia Commons. 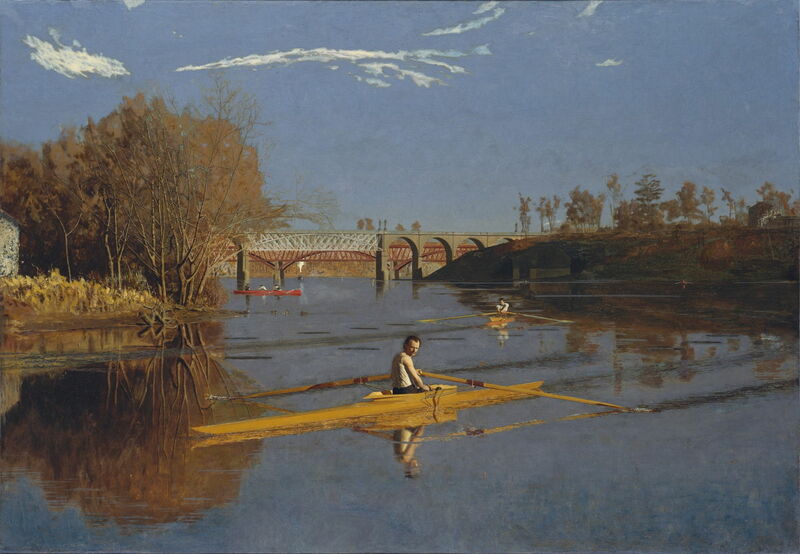 Eakins’ most frequent early depictions of Philadelphia appear confined to the Schuylkill River, as it passes through the city, in his series showing rowing on that river. Thomas Eakins (1844–1916), Lafayette Park, Washington, D.C. (1877), oil on panel, 26.7 × 36.8 cm, Philadelphia Museum of Art, Philadelphia, PA. Wikimedia Commons. 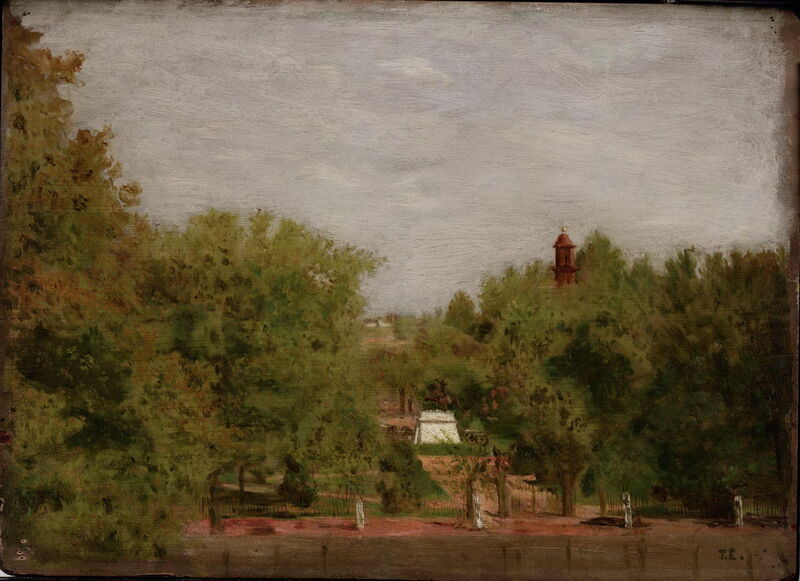 A little later, he painted this scene of Lafayette Park, Washington, D.C. (1877). Originally intended as part of the pleasure grounds around the Executive Mansion (the White House), Eakins allows only small fragments of buildings to peep through its dense trees. Thomas Eakins (1844–1916), A May Morning in the Park (The Fairman Rogers Four-in-Hand) (1879-1880), oil on canvas, 60.3 × 91.4 cm, Philadelphia Museum of Art, Philadelphia, PA. Wikimedia Commons. 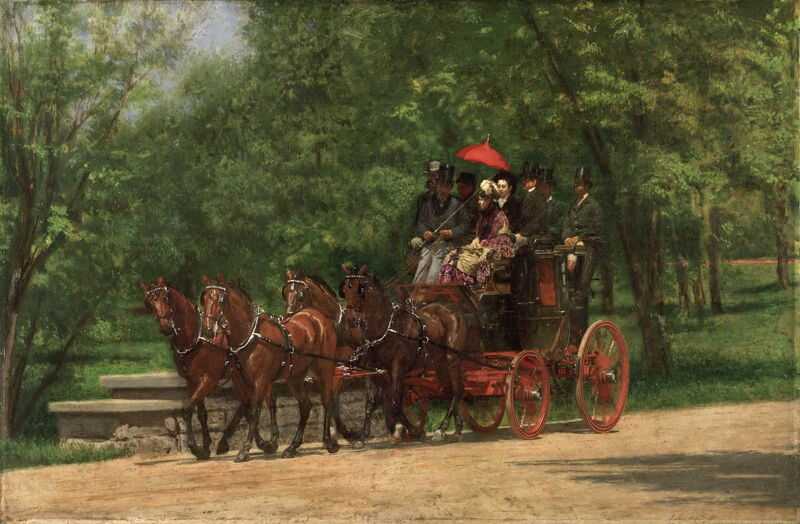 His A May Morning in the Park (The Fairman Rogers Four-in-Hand) (1879-1880) shows Fairmount Park in Philadelphia, without giving the slightest glimpse of the city at all. Although Eakins made copious oil sketches and photographs, and painted many scenes set in landscapes, he does not appear to have shown any interest in depicting the urban landscapes in which he lived and worked. Chase did not train in Paris, but in Munich. On his return to the US in 1878, he moved to New York, where he kept a studio for most of the rest of his life. From about 1886, he started painting outdoor scenes around Brooklyn and other parts of New York City, but ceased these by the time that he started teaching plein air painting at Shinnecock, Long Island, in 1891. 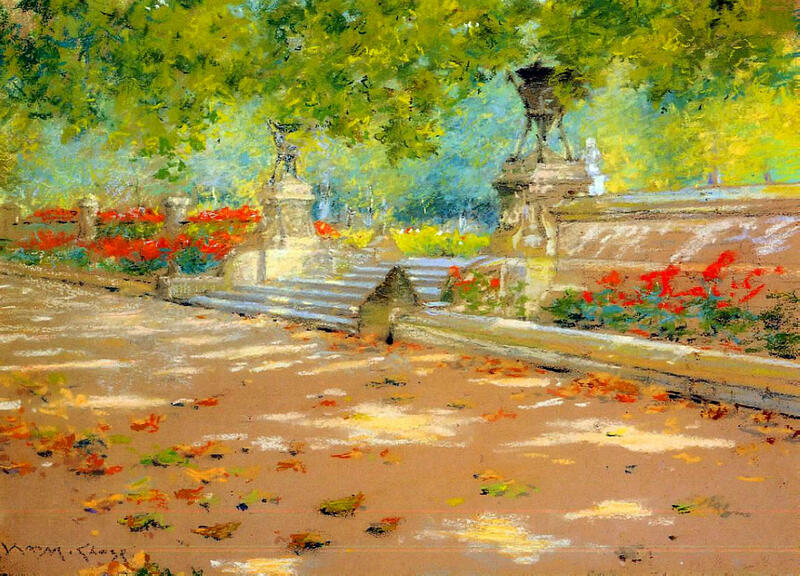 William Merritt Chase, Terrace, Prospect Park (c 1886), pastel on paper, 24 x 35 cm, Smithsonian American Art Museum, Washington, DC. WikiArt. Over this period, Chase’s favourite scenes were those of the huge Prospect Park in Brooklyn. This was the next project for Frederick Law Olmsted and Calvert Vaux after they had completed Manhattan’s Central Park. It was partially opened in 1867, but not completed until 1873. William Merritt Chase (1849–1916), Brooklyn Landscape (c 1886), oil on panel, dimensions not known, Private collection. The Athenaeum. 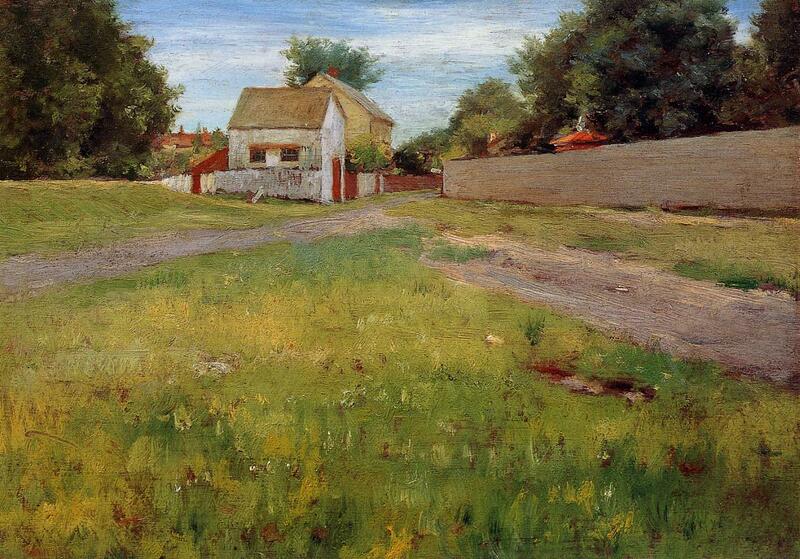 Brooklyn Landscape (c 1886) shows a few buildings in the distance, which could as easily have been a more rural setting. The rough land in the foreground does at least have the appearance of urban waste ground, before the area became more densely developed. William Merritt Chase (1849–1916), The East River (c 1886), oil on panel, 25.4 x 40 cm, Private collection. The Athenaeum. 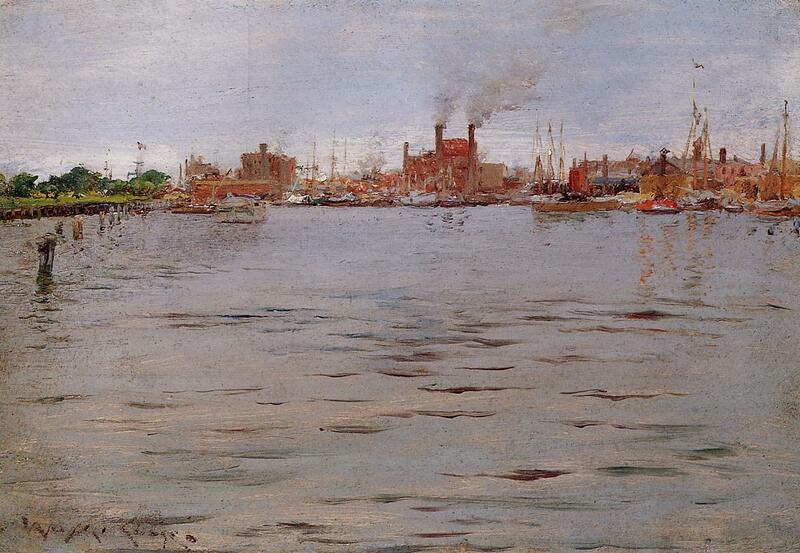 In his waterfront view of The East River (c 1886), Chase avoids getting too close to the factories and warehouses seen on the skyline. 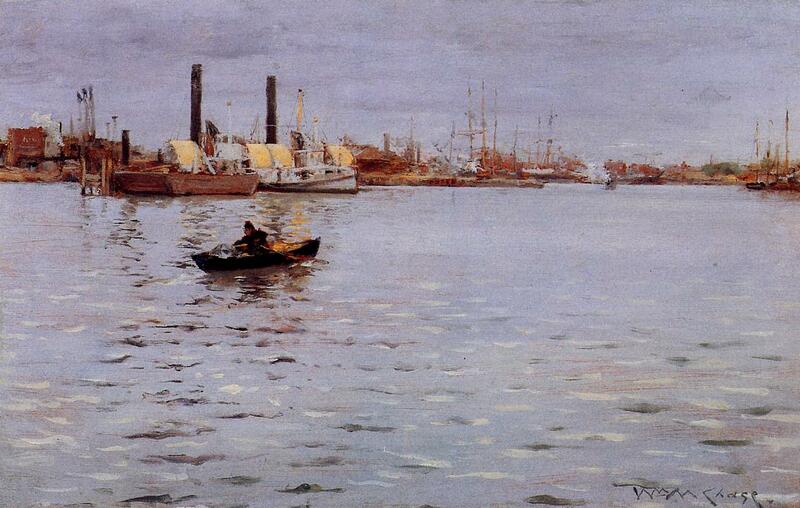 William Merritt Chase (1849–1916), Harbor Scene, Brooklyn Docks (1886), oil on panel, dimensions not known, Yale University Art Gallery, New Haven, CT. The Athenaeum. In Harbor Scene, Brooklyn Docks (1886), he follows the same compositional principle, even bringing in some grass and trees on the left. 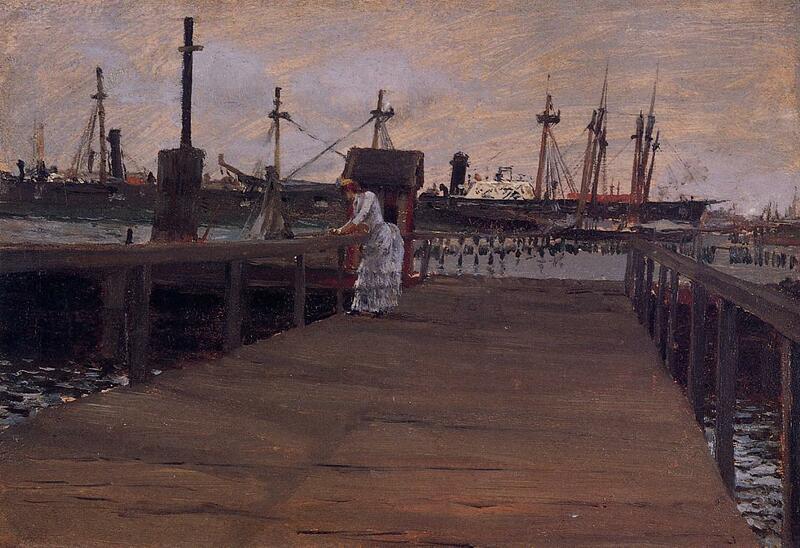 William Merritt Chase (1849–1916), Woman on a Dock (1886), oil on board, dimensions not known, Private collection. The Athenaeum. Woman on a Dock (1886) appears to be the closest that Chase comes to a ‘real’ urban waterside, one dominated by manmade structures, although the buildings are here obscured by large ships. William Merritt Chase, Summertime (Pulling for Shore) (c 1886), oil on panel, 26.67 x 40.64 cm, Private collection. WikiArt. Summertime (Pulling for Shore) (c 1886) returns to the security of trees and grass. 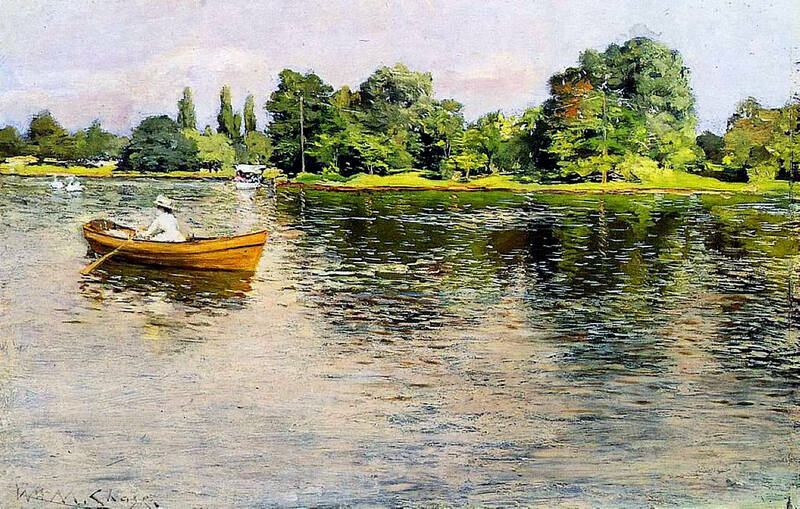 William Merritt Chase (1849–1916), Boat House, Prospect Park (1887), oil on board, 26 x 40.6 cm, Private collection. Wikimedia Commons. 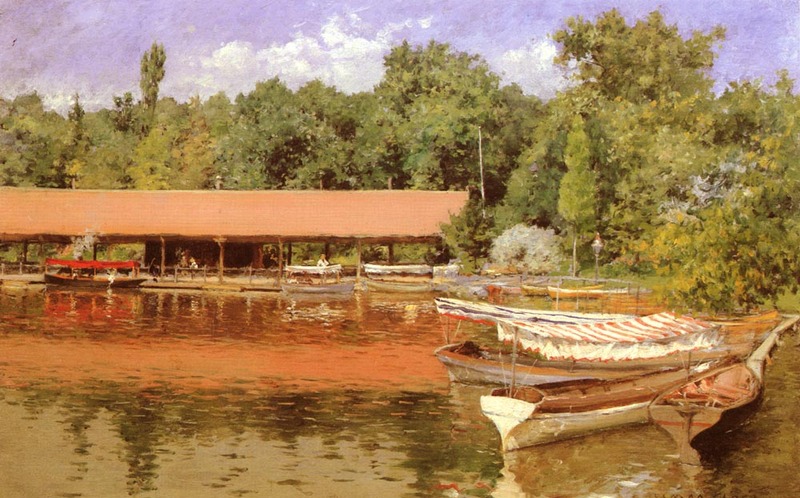 The buildings which Chase did paint were seldom those typical of cities: Boat House, Prospect Park (1887) is far from urban, and the scene almost empty of people. 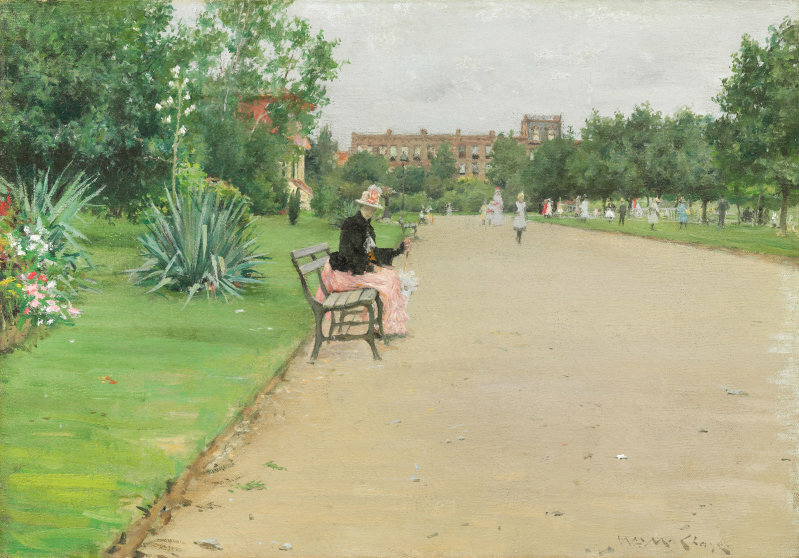 William Merritt Chase (1849–1916), A City Park (c 1887), oil on canvas, 34.6 x 49.9 cm, The Art Institute of Chicago, Chicago, IL. Wikimedia Commons. A City Park (c 1887) shows the edge of a park, where there are more people, and some distant buildings, but like his earler waterfront views, they are kept sufficiently small as to avoid their dominance. 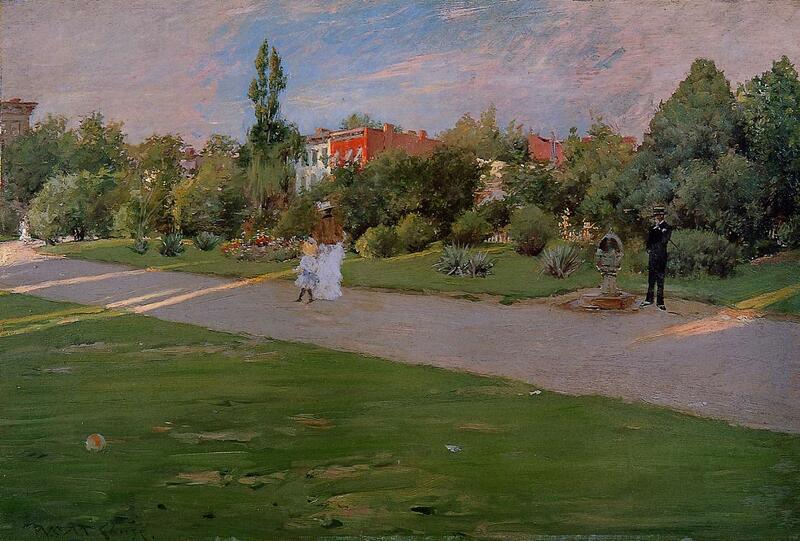 This view of Prospect Park, Park in Brooklyn (c 1887), follows the same rules. William Merritt Chase (1849–1916), Washing Day – A Backyard Reminiscence of Brooklyn (c 1887), oil on wood panel, 38.7 x 47.3 cm, Private collection. The Athenaeum. 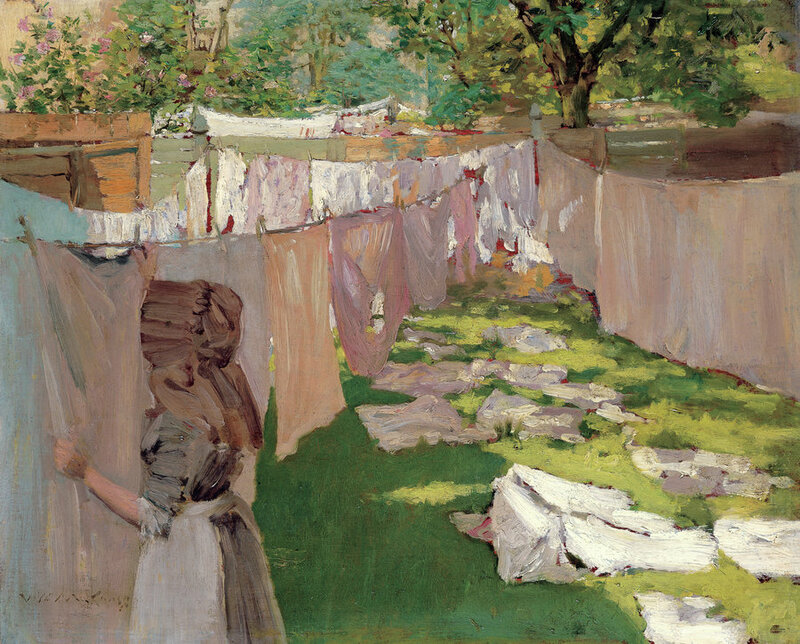 Chase also painted a few works which take us into the backyards, including his Washing Day – A Backyard Reminiscence of Brooklyn (c 1887). 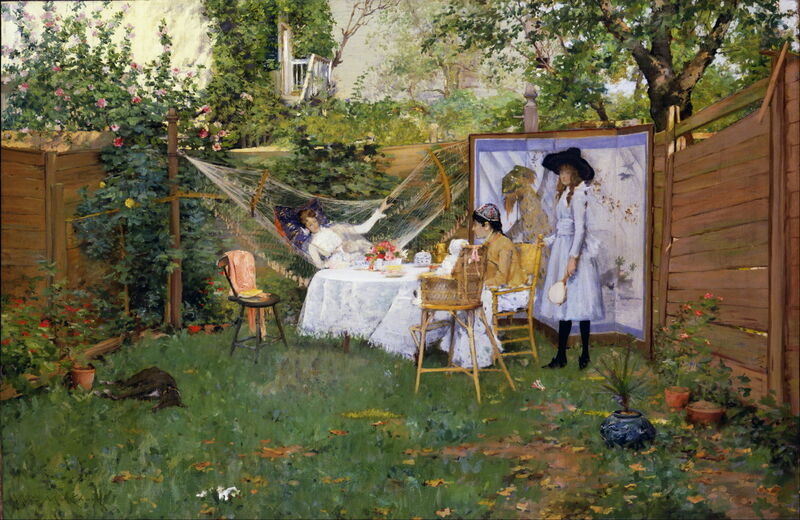 Apart from the dominating washing, and the shrouded woman hanging it out, all we are shown are trees and grass. In his The Open Air Breakfast (c 1888), the house in the background is cunningly disguised, so as to show some disembodied steps and a doorway. 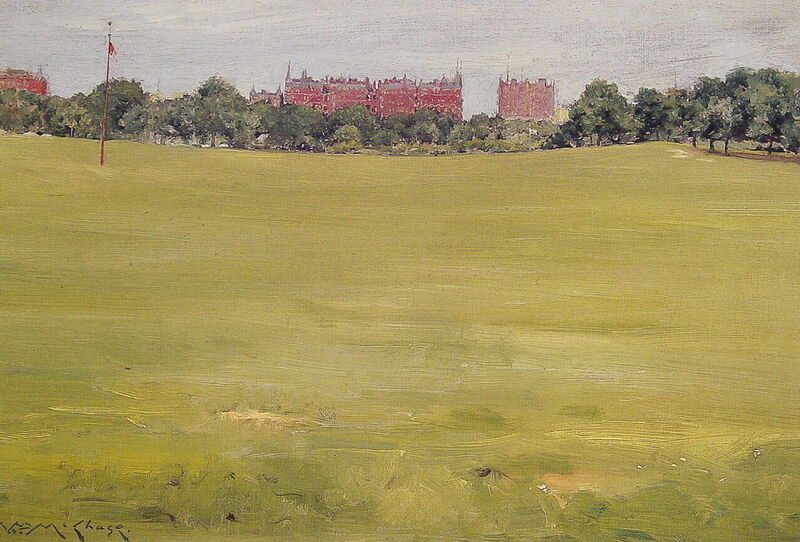 William Merritt Chase (1849–1916), View from Central Park (1889), further details not known. Wikimedia Commons. Painted towards the end of this phase of his landscapes, his View from Central Park (1889) relegates the large buildings of Manhattan to its distant skyline. Chase’s paintings of New York City are remarkable for his skill in turning each into a patch of green countryside, and carefully avoiding any passages which might look in the least bit urban. Posted in General, Painting and tagged Chase, cityscape, Eakins, landscape, painting. Bookmark the permalink. My sincere apologies: owing to a versioning problem, the first version of this article which appeared here did not allow you to enlarge all the images. I have now corrected that, and it should work correctly. Has someone been reading your emails?